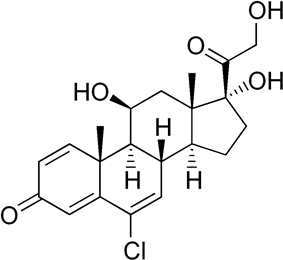 Cloprednol is a synthetic glucocorticoid. It has been investigated for use in asthma. ^ Ortega E, Rodriguez C, Strand LJ, Bessler S, Segre E (1976). "Metabolic effects of cloprednol-a new systemic corticosteroid". J Clin Pharmacol 16 (2-3): 122–8. ^ Ellis EF, Morris HG, Kiechel F, Pollock JD, Strand LJ (October 1979). "Short-term efficacy and side effects of cloprednol in children with asthma". J Clin Pharmacol 19 (10): 675–83.